A free 6 volumes series of textbooks on the subjects of electricity and electronics. The author wrote:These books and all related files are published under the terms and conditions of the Design Science License. These terms and conditions allow for free copying, distribution, and/or modification of this document by the general public. 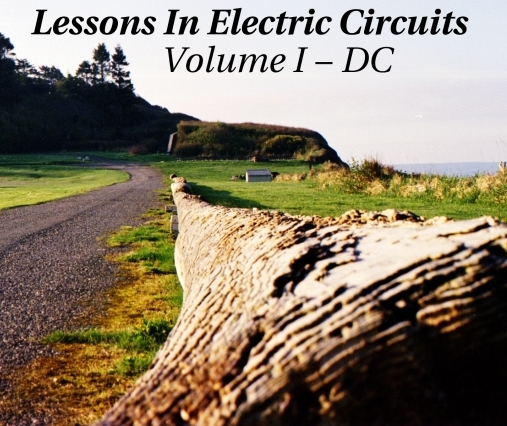 Lessons in Electric Circuits was compiled from years of lecture notes and ideas, with the primary goal was to put readable, high-quality information of industrial electronics into the hands of students, yet keep the book as affordable as possible. This book was written to be a good enough book without delving too heavy on the math, while still maintaining a lot of important information. It must be mentioned that although the book strives to maintain technical accuracy in all of its content, the subject matter is broad and harbors many potential dangers. Electricity maims and kills without provocation, and deserves the utmost respect. Experimentation on the part of the reader is strongly encouraged, but only with circuits powered by small batteries where there is no risk of electric shock, fire, explosion, etc. High-power electric circuits should be left to the care of trained professionals! The Design Science License clearly states that neither the author nor any contributors to this book bear any liability for what is done with its contents. One way to reduce the necessity of setting up your own laboratory, is to utilize computer simulation. One particular computer program called SPICE serves that purpose. It is a text-based piece of software intended to model circuits and provide analyses of voltage, current, frequency, etc. Although nothing is quite as good as building real circuits to gain knowledge in electronics, computer simulation is an excellent alternative. One of the advantages is that SPICE could be used within a textbook to present circuit simulations to allow students to "observe" the phenomena for themselves. This way, the readers could learn the concepts inductively (by interpreting SPICE's output) as well as deductively (by interpreting the book's explanations). Furthermore, in seeing SPICE used over and over again, they should be able to understand how to use it themselves, providing a perfectly safe means of experimentation on their own computers with circuit simulations of their own design. Tony R. Kuphaldt is an instructor in the Instrumentation and Control Technology Department at Bellingham Technical College, Washington Area. He specializes in technical writing, technical instruction, electronic circuit design (including PCB layout), computer programming (C mostly), technical drawing, welding (gas and arc), machine maintenance, basic machine tool operation (metal lathe mostly), curriculum development, public speaking.